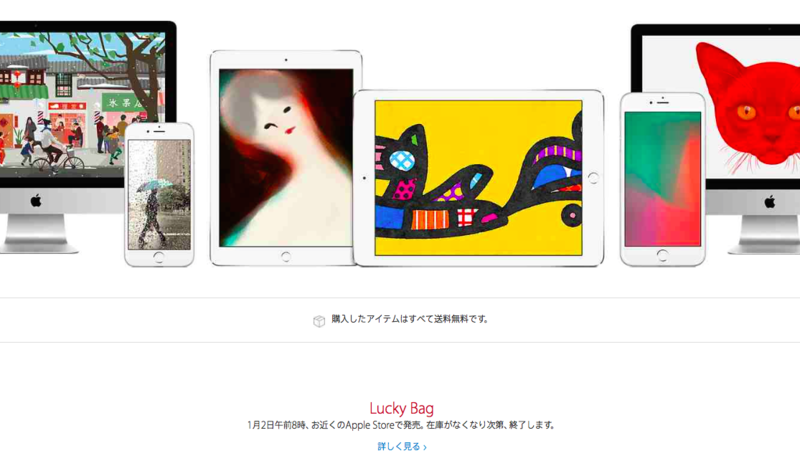 As expected, Apple has begun handing out “Lucky Bags” at its stores in Japan in observance of its annual New Year's retail tradition in the country. So, what's inside Apple's Lucky Bags this year? As reported by 9to5Mac, there are four classes of bags randomly given to customers taking advantage of Apple's limited-time, while-supplies-last offer. The “luckiest” class features a 128GB 11" MacBook Air, an Air Jacket case, and a Twelve South PlugBug. Two of the other classes feature a 16GB iPad Air 2 or a 16GB iPad mini 3, along with an Ultimate Ears Boom Bluetooth speaker. And the final and presumably most common class features a 16GB fifth-generation iPod touch and an iTunes gift card. All four bag types include an Apple TV, a limited-edition Incase Icon Slim backpack, a pair of Powerbeats2 by Dre headphones, and a limited-edition Mophie Juice Pack Powerstation. The Lucky Bags are so called because their specific contents, usually including Apple products and related accessories, are unknown to the customers buying them until they're opened. In any case, the actual total cost of the contents of a bag is much higher than the price for which the bag was purchased, which is about ¥38,000 ($315). See also: Apple implements price increase for iOS and Mac Developer Program in UK and Germany, Just in time for the new year, Apple goes global with its 'Start Something New' campaign, and Apple facing possible class action lawsuit over 'massive data footprint' of iOS 8.